soil (sand, silt, clay, humus), fertilization, weather (drought, too wet), water (irrigation, drainage), engineering (mechanical, intensive), region (north, south), location (sun, wind), year, early or low variety, cultivation, varieties and species, predation and disease, time of sowing and reaping... and all these factors influence each other. But based on averages for large-scale farming in the early 21st century, we can give a rough idea. For some crops, there is little information available, in others the yield is not expressed in tonnes / ha, but e.g. in little bunch (parsley), tuber (fennel, celery), etc. It is not always clear what weight is specified, gross weight or net sellable or edible yield without e.g. cabbage stalks, beet - or root leaves, husks and straw, pods etc. Many of that ’waste' of course is excellent fodder and bedding. 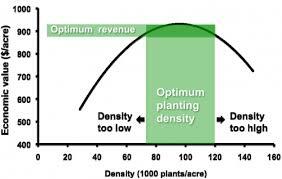 One hectare (ha) is 100 m × 100 m = 10,000 sqm (m2). Measure a piece of 3.3 x 3.3 meters, about the size of a small bedroom or kitchen in your garden, then you have about 10 m2. That might be easier to understand and oversee. So divide the harvest thus by 1,000, or you just drop the 000 zeros after the comma. Of course you do not need just kilograms yield, but also varied and healthy diet. How many seeds do you need on a plot? The ratio between the quantity of seed and the crop yield is called the seed to crop ratio. It is the percentage of the harvest that is stored and needed to be able to sow sufficient on the plots the next year. If 180 kg per hectare is needed for sowing wheat, and that yields 7,500 kg, then the seed to crop ratio is 180/ 7,500 = 0.024 or 2.4% of the harvest that should be stored for seeds. Usually, however seed is grown apart. The relationship between harvest weight and seed weight is dependent on the above- mentioned crop yield factors. Also germination, picking by birds, fungi, temperature, seeding distances and fertilizing play a role. Guidelines for sowing density are sometimes given in number of seeds per linear (row crops) or per square meter (or hectare) (broadcasting the seed). For very small for seeds, they be can mixed with dry sand of approximately the same grain thickness, so as not to to sow too close the seeds. Usually seeds are traded per kilogram or gram. An indication of the number of seeds is given by the thousand grain weight. The TGW is the weight of 1000 seeds. In the Brussels sprouts of this, depending on the breed, is 3 to 4 grams. (Or one gram contains between 220 and 333 seeds).